A few weeks ago I bumped into Brent at a local crag while he was running an intro-to-gear course. He demonstrated how he’s been using a clove hitch at the master point of his anchors and I was impressed enough that I scheduled a time for us to shoot some demo videos. What’s the big deal? Why not just use the same old overhand knot we’ve all been using? I don’t know about the rest of you but I am sick and tired of undoing snugged down knots in Dyneema slings. Most of the time the sling just remains knotted for the rest of the day and then it takes teeth and cussing to get the knot undone. Watching the speed that Brent was able to both setup and break down the anchor simply amazed me. As I write this, ice climbing season is still a good ways off but I’m really looking forward to using this setup this winter. In the video below Brent demonstrates how to setup an anchor with a Dyneema sling at a fixed station using a clove hitch at the master point. He also discusses the other advantages with the clove hitch over either of the two commonly used knots. If you are using Dyneema slings in your anchor systems then we highly recommend watching DMM’s test on the strength of Dyneema slings. They demonstrate some scary failures in their drop tests and detail some very interesting results in comparing overhand knots in Dyneema Slings vs Clove Hitches. 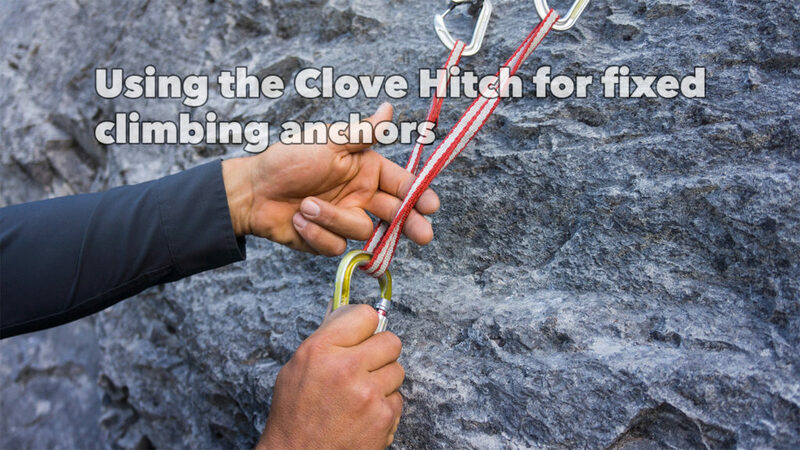 When we first published this article there was a substantial amount of discussion of whether the clove hitch was truly an acceptable alternative to more traditional anchor knots. In the months that followed Petzl released a series of online guides for best climbing practices including building belay anchors. The clove hitch anchor is one of the methods that they recommend. See it here. Mythbusting clove hitch slippage and other climbing gear myths.